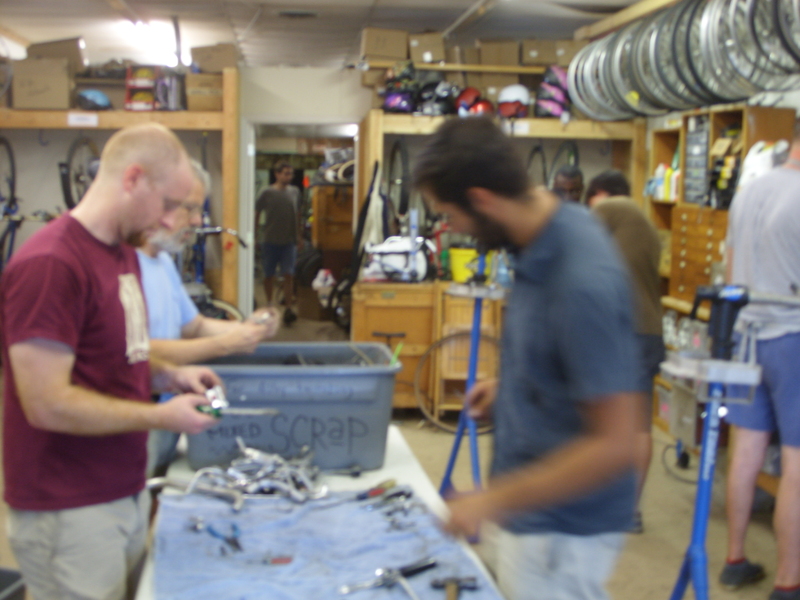 What an exciting week around the bike shop! Just because there are 10,000 riders out traversing the state does not mean there are not 10,000 more still going about their bicycling business as usual. We have a healthy share of them right here in Iowa City and they have been keeping us hopping this week. 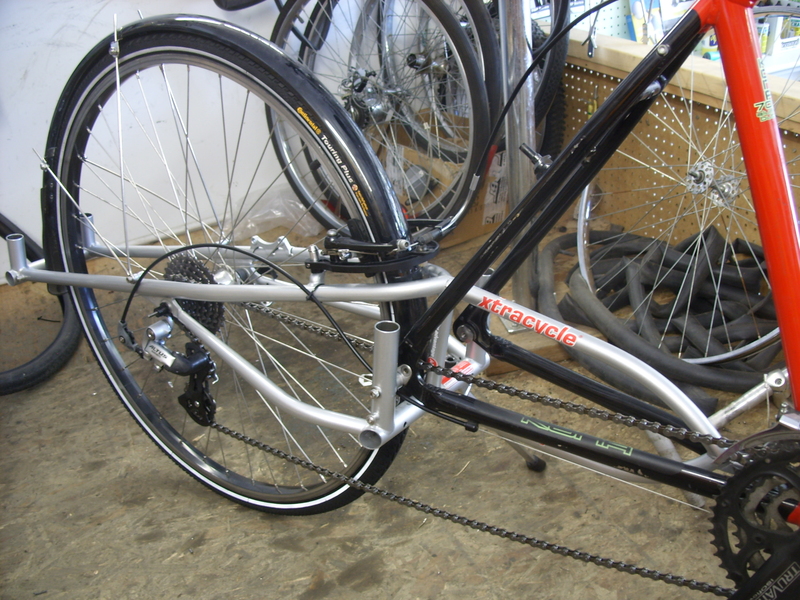 We added the Xtracycle FreeRadical to this Kona. Here it is without the bags. 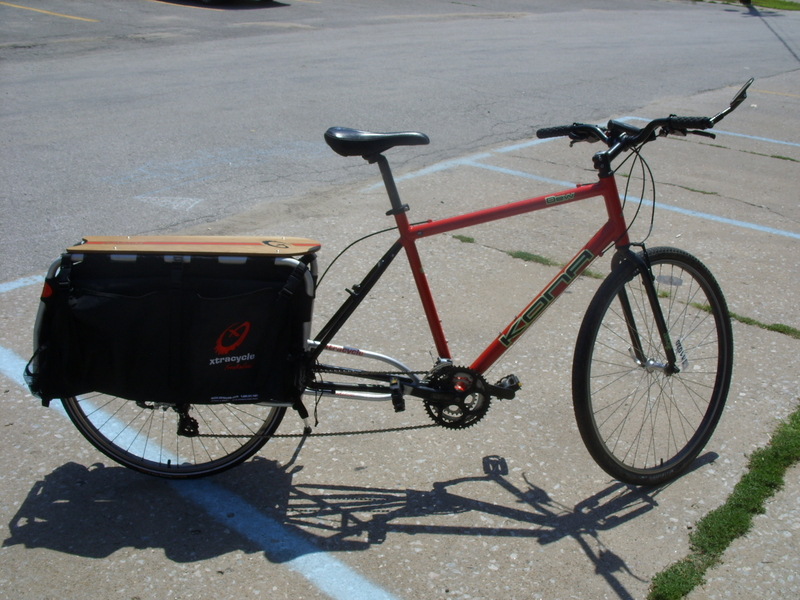 Because this bike has 700c wheels, the Xtracycle needed the brake adapter to move the posts higher. It is a slick solution, we have seen it used on a traditional bike to run 700c’s on a 26″ bike. This bike will probably be getting a new Xtrastout rear wheel with a disc brake at some point so then that whole contraption can come off. 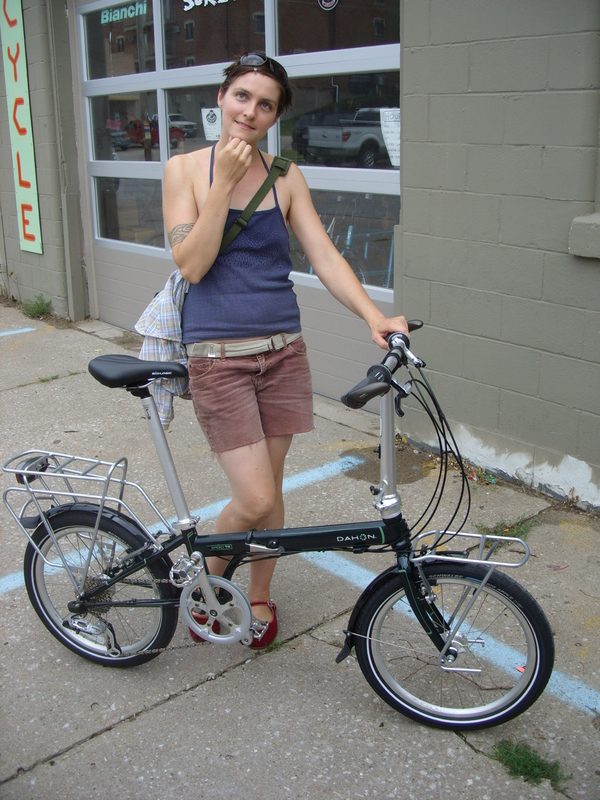 In shorter bike news, we are full fledged Dahon dealers, and the bikes are here! Hmmm, where can’t I go with this bike? Cody ordered this Speed TR to display at the shop and to demo out in the world. We also have a Speed D7 in stock (the best selling folding bike in the whole wide world) and a Curve D3, but that will not be here for long as it’s new owner should be in today to pick it up. 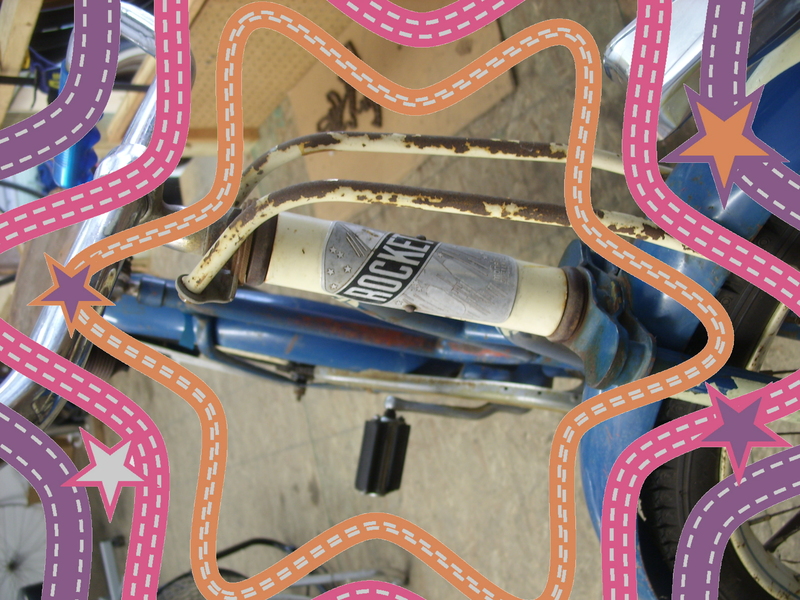 An internal 3 speed, 16″ Big Apple tires and a center stand! 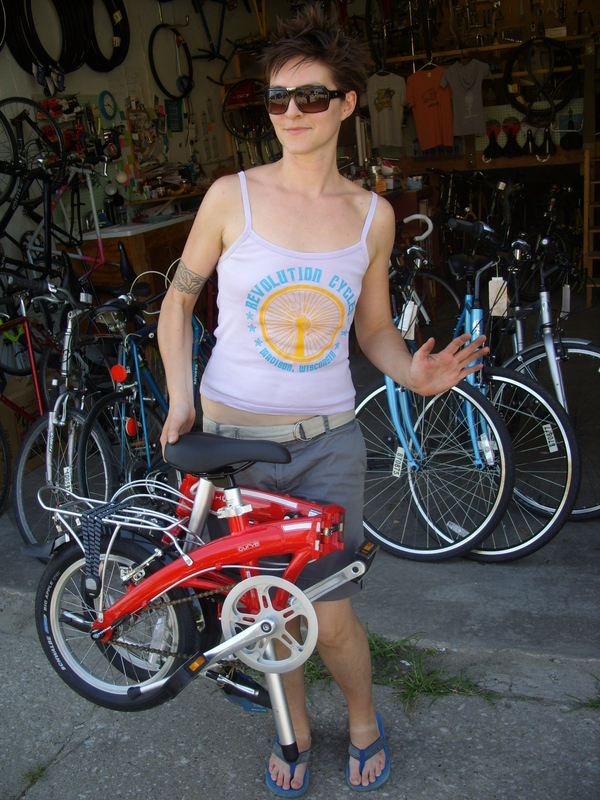 And yes, it folds up really small so you can take it anywhere, so it can take you anywhere! Dustin Busch knows when to hold em or fold em. Never one for walking or running away, though, he gets himself plus his guitars and amp (with Volvo door handle) around with his bike and Burley Nomad trailer. 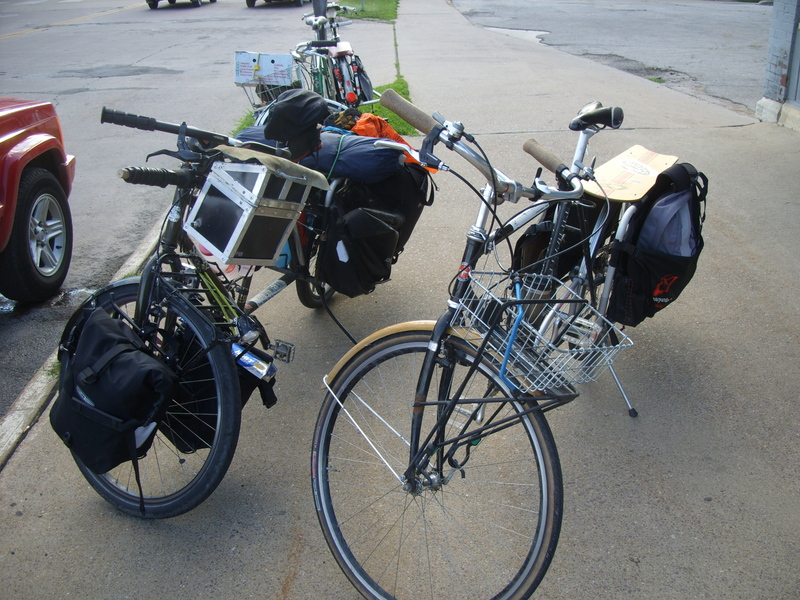 We stopped by the Bike Library on the way home last night to deliver a bike to them and this loaded Big Dummy was parked out front. 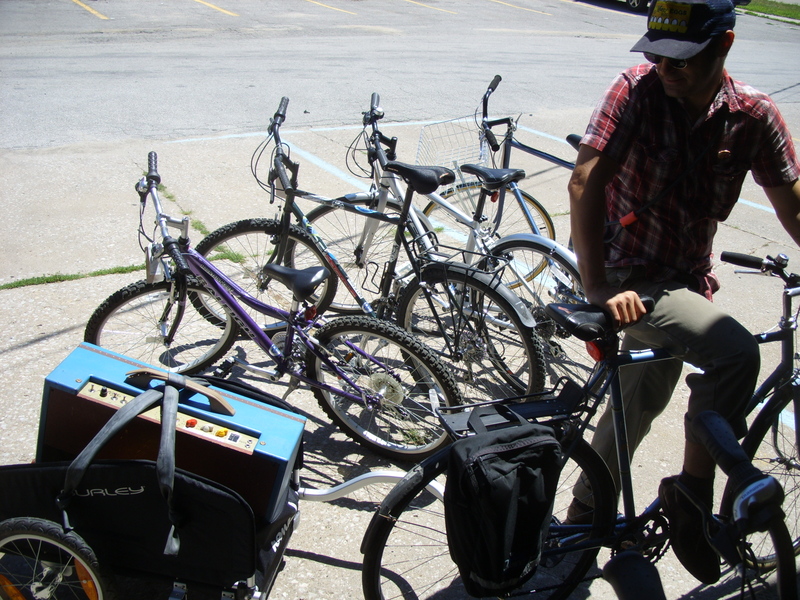 Inside we met it’s rider Jesse, on the right, who was helping sort metal for their salvage operation. He is passing through town on his way from Montreal to Argentina! 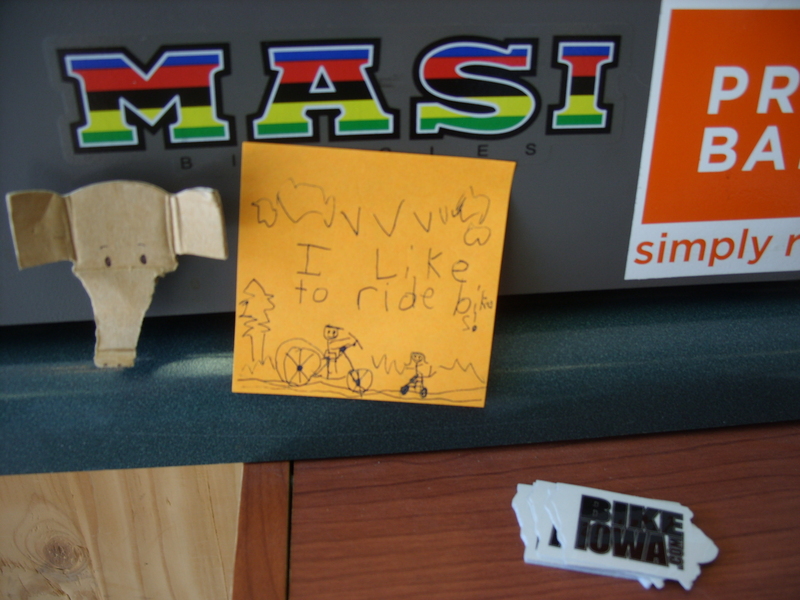 Iowa City was supposed to be a normal overnight kind of stop for him, but he has found much to do and is spending a few days. We met at the Mill later for beers and heard more about his trip, what a ride! 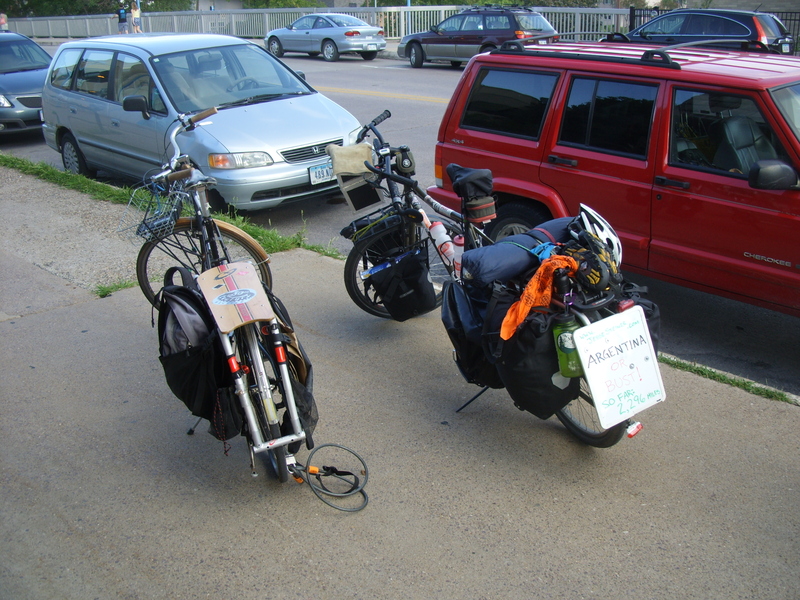 He is going to make a little detour for RAGBRAI but then will be back on his way and we wish him luck, on both rides. My ever-evolving Puch Marco Polo recently went through a drivetrain change. What started as a traditional ten-speed was quickly whittled down to five by removing the front derailleur and one chainring. Last spring I finally admitted that the classic Shimano 600 rear derailleur was toast. But, what to do next? I built a SRAM i9 internally geared hub to a SunRingle CR-18 rim, and it’s love, I say. You can tell me all you want about rolling resistance and extra weight, but I won’t listen because I don’t care — I’m officially hooked on internally geared hubs. Okay, well, there is a little matter of the twist shifter. It’s the only option for this particular hub, and I confess I’m not a fan. But that’s a shifter issue, not a hub issue. Besides, with a sprinkle of precision science, there may be other options after all. 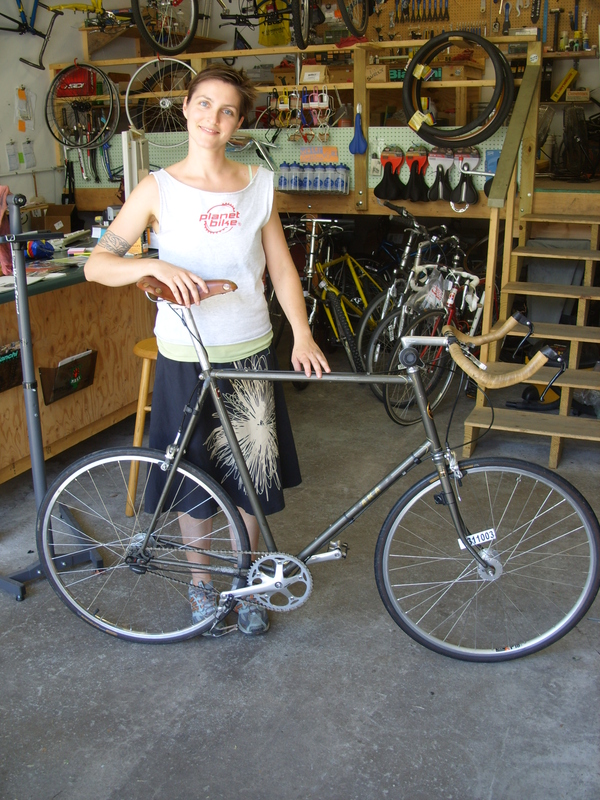 In other internal gear news this awe-inspiring bike came to us as a lovely single speed. Not enough gear options for the owner’s upcoming trip to Montana, I was the lucky one to build a SRAM S7 wheel and set up the new configuration. 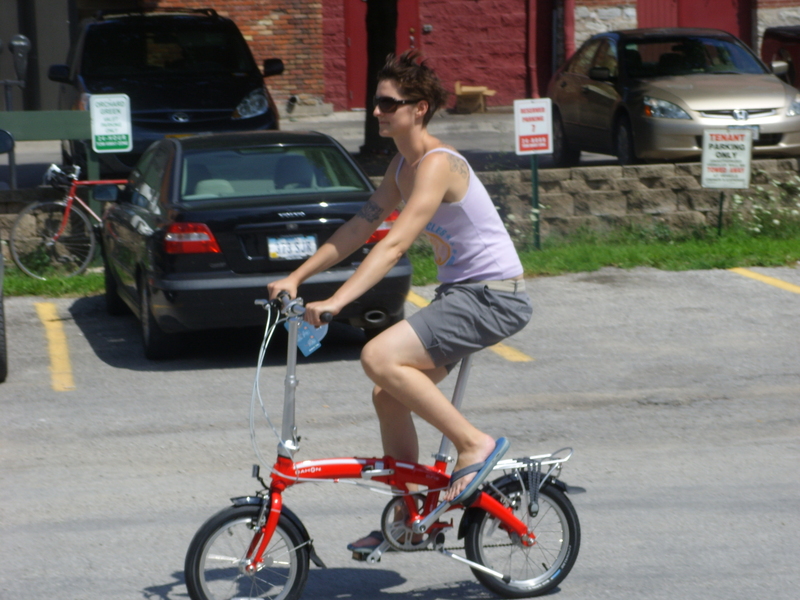 Note the 27″ wheels. 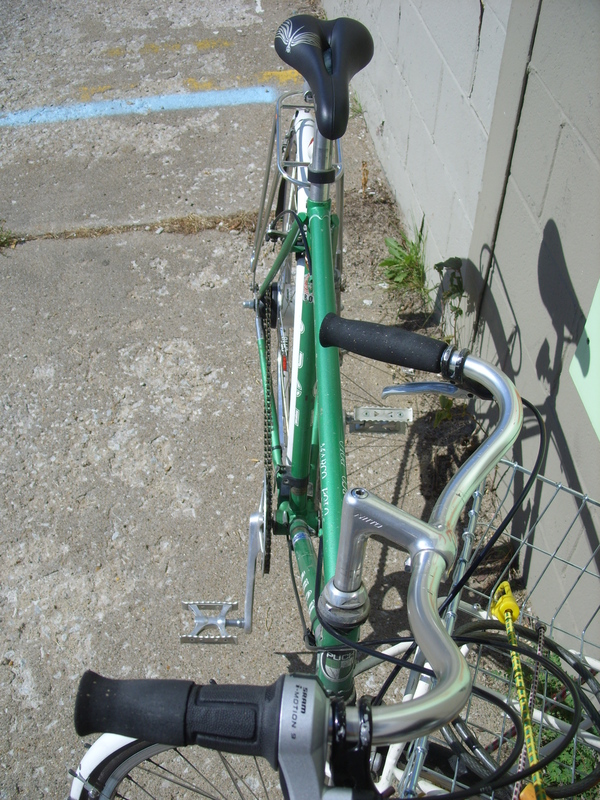 Note the stem-mounted shifter. Note the saddle up to my elbow! 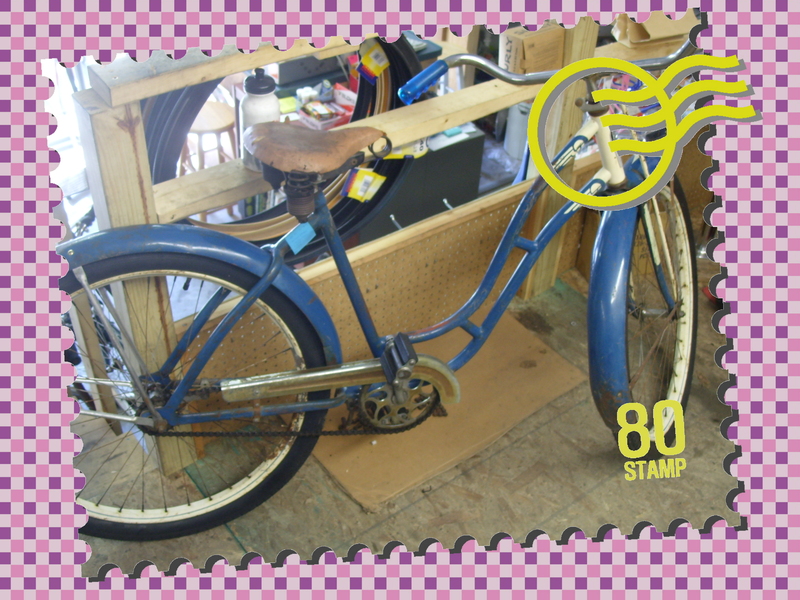 New feature at the 30¢ blog, where we will strive to bring out the inner beauty of bikes that visit us through the application of gaudy borders to their portraits! Oh, who cares about inner beauty, this Monark Rocket is pretty as a picture postcard! 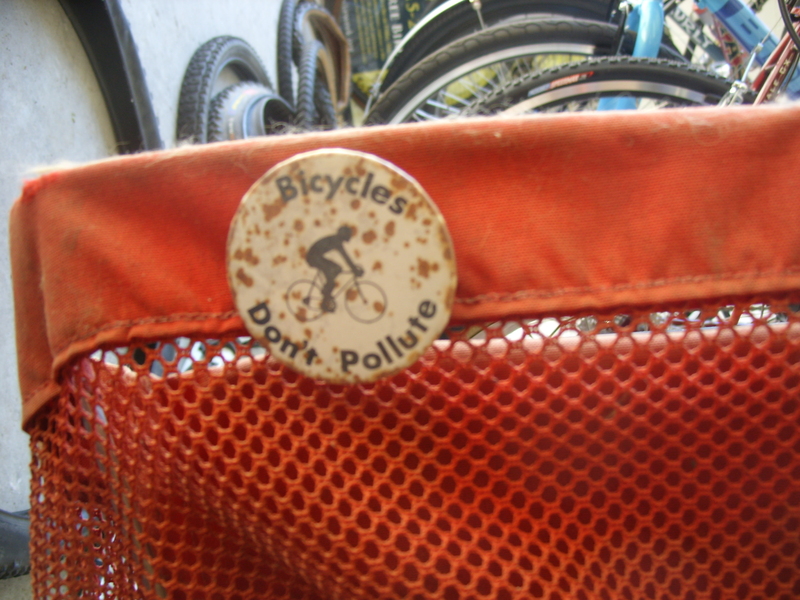 No airbrushing here, an authentic patina on the headtube badge. A few more hearts might be in order here. 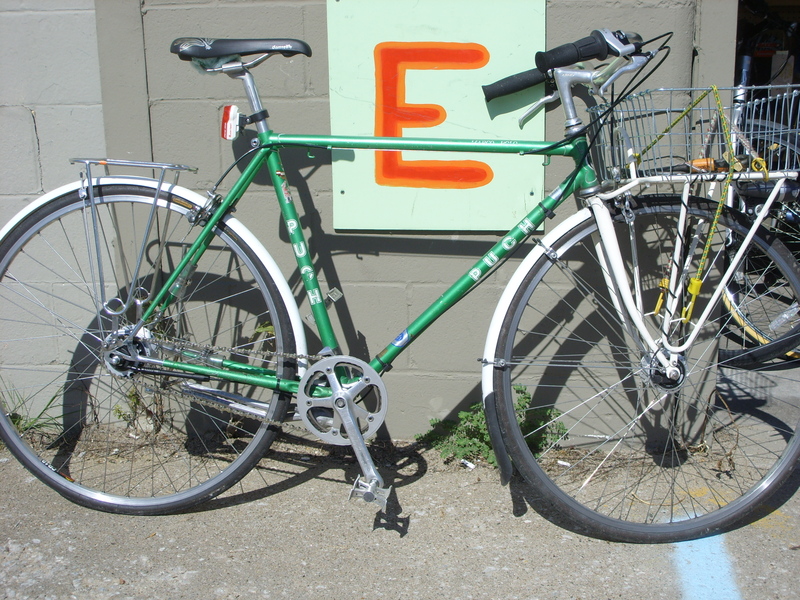 This is a single owner 1972 Schwinn World Voyageur! 4130 tubing, Dura-Ace crank, chrome lugs and dropouts, made in Japan. 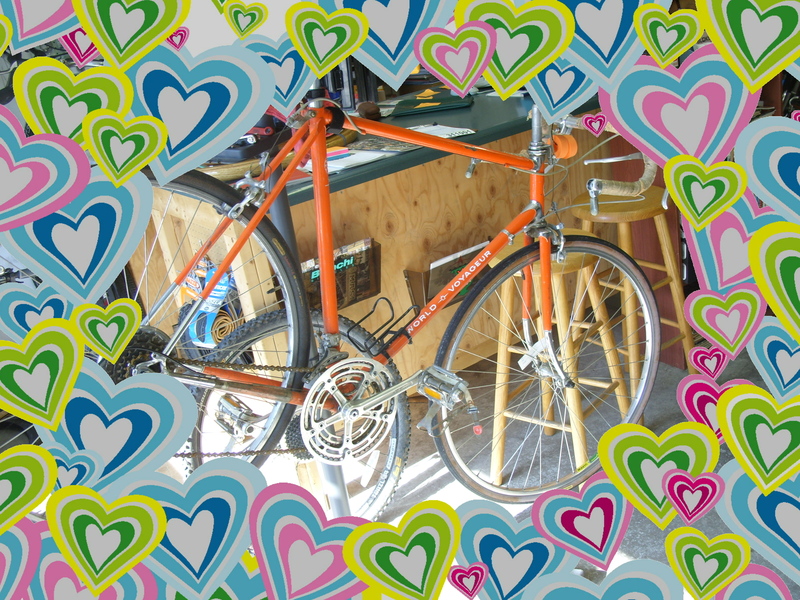 The owner reported that this well used bike has been through numerous wheelsets and deraillers over its long life, some new orange cloth bar tape and a tune up will see it back out for more. Have a great holiday, remember we are here today but will be closed Monday!